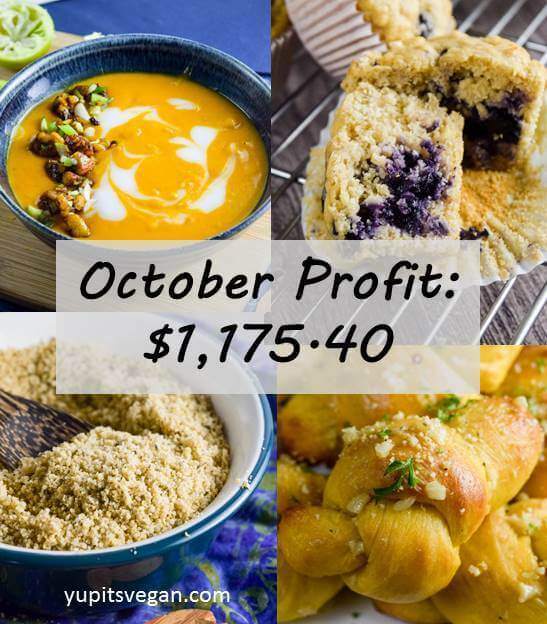 Blog Income: October 2016 Summary | Yup, It's Vegan! Shannon checking in. I’ve been writing these blog income reports since April of this year. It’s a nice way for me to think through my goals and progress, and hopefully they’re helpful and interesting to other bloggers, too. I don’t have a partner-in-crime who does the technical side of the website. It’s the one-woman Shannon show around here! Balancing the creation of recipes, writing and photography; with reviewing my website analytics and implementing new strategies for growth and monetizing; with my full-time job… it’s a lot. I’m not sure that people always realize how much work it is to have a food blog. But I am SO passionate about food and this little business that I have created. And, I’m hopeful for the future, with many goals for myself that I want this website to help me to achieve. So month after month, even when I was tired or unenthusiastic, I put the work in. For a couple of years, this was a hobby that mostly covered its expenses. But not only am I now squarely in the green, I’m earning enough from this blog that it’s starting to really make a difference for me. It’s incredibly exciting. I published 3 new recipes in October. 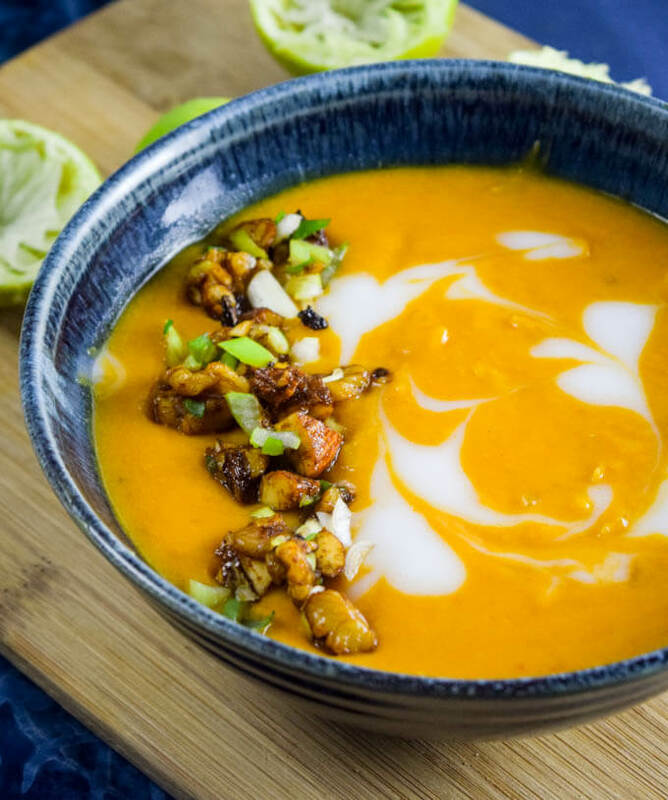 Thai Roasted Butternut Squash Soup – This soup was inspired by a favorite local restaurant of mine and has a delicate but satisfying flavor and creaminess. I think it might even be an improvement on the original! 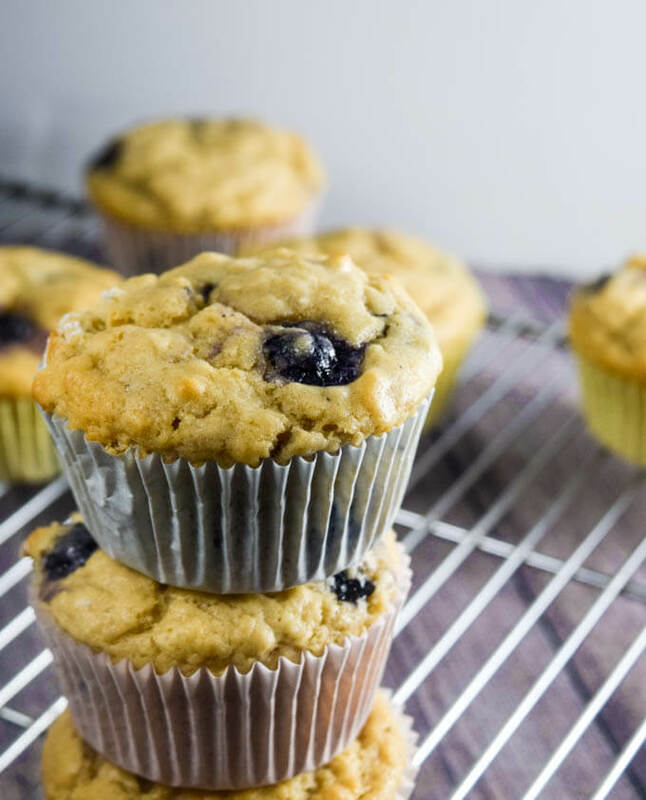 Vegan Lemon Blueberry Muffins (from Aquafaba) – Doing cookbook reviews: it’s a blessing and a curse. It seems pretty glamorous, right? You get a free cookbook in the mail. Free! What you might NOT know is that in *most* cases, the cookbook comes with a short list (under 10) of recipes to choose from for what can be republished in your blog post. I could do only a cookbook review and forgo the recipe part, but since people read my website for the recipes, I choose to include one. But the recipes on my website have certain characteristics that my readers have come to expect. They’re generally made from scratch, they don’t call for things like vegan butter, and I try to make them as seasonal as possible. So, what if I’m reviewing a cookbook and most of the recipes are either off-season or not the type of food I’d usually cook? What if they’re things that are delicious but don’t photograph nicely? What if I make, photograph, and enjoy another recipe from the book but am not permitted to share it? Doesn’t matter, I still have to choose one from the list. I loved this muffin recipe. But I know as well as you do that a lemon muffin recipe would be more appealing in the spring than in the autumn. In the end, supporting vegan cookbook authors (and offering a free giveaway to my loyal readers) wins out even though I don’t expect a lot of traffic to this recipe. But of course it’s not ideal to spend the many hours that it takes to write and photograph a blog post on something that isn’t my first choice. I certainly don’t want to seem ungrateful. Getting cookbooks in the mail thrills me to no end. But I thought that you might be interested in this insight, that everything free has a cost of some kind. 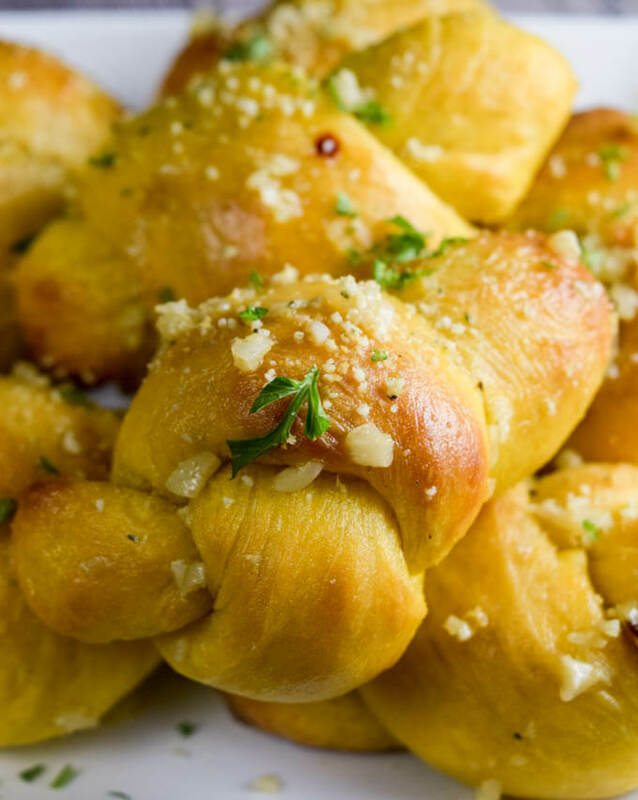 Pumpkin Garlic Knots – Oh my word. Recipe of the year, right here. These were so good that I ate them instead of my dinner. Then I ate the rest for dessert. I made them on a night when he wasn’t home, so my boyfriend didn’t get to taste ANY of that first batch and had to look longingly at the pictures. Luckily for him, these are the kind of thing that I’m going to start making whenever I have company, because… well, just look at them. They’re ridiculous. You’ll notice that this is the first time I’ve ever listed groceries as an expense. At the end of October I made the decision to start tracking some of my spending on food and deducting it as a business expense. This was not a decision that I took lightly, since I have no desire to exploit the system; however, it began to make more logical sense as I noticed myself picking up extra items to add to recipes mainly for presentation purposes (example: extra green onions and sesame seeds to sprinkle on top of an Asian-inspired dish). So from now on, to the best of my ability I’ll be tracking and deducting groceries this way: If the item was purchased exclusively for testing or preparing and photographing a recipe that makes its way onto my website, I list 50% of the purchase price as an expense. 50% isn’t a magic number, but rather an acknowledgement that I do generally eat the recipes I test and photograph, and would have food expenses regardless of whether I had this business. However, the inclusion of food on my blog does affect my purchasing decisions and so to address both sides of the equation, I deduct just 50%. This number is in line with what is used by other food bloggers I spoke to about the topic and what several accountants and former auditors have confirmed would be fairly considered “ordinary and necessary”, e.g., legally a business expense. (Please do not take this as tax advice from me, and please do consult a professional about your own income and tax situation if needed). What else was new this month? None too much; I spent a TON of time in October cooking and photographing new recipes. At the time of writing this income report, I have a full SEVEN recipes photographed and finalized, just waiting for a blog post to be crafted around them. This is the farthest ahead that I have ever been, in the history of my website, lol. I’m optimistic that November, December, and January (traditionally high-traffic months for food blogs) will be a success because of my preparations! Being ahead on recipe development also frees up some time for me to finally get back to that eBook I’m trying to finish. I’ve also been spending some time cleaning up broken links/404 errors, untidy old posts from when my blog was still hosted on wordpress.com, and a few miscellaneous website quality items. Other side note: why were so many of my recipes orange in October? I’m going to make an effort in the coming months to make my recipes more colorful again. Stay tuned; I can already confirm that November was an exciting month and I can’t wait to share why!